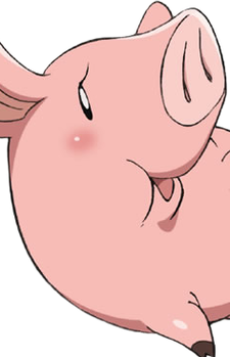 Hawk is a talking pig and Meliodas's companion. He is introduced as the cleaner of the Boar Hat bar who helps clean the disgusting food scraps. He is a relatively large pink pig who wears an eye ring with the word star boar on his left ear. His body is well rounded and his legs are fairly short. He has a unique patch of black spots shaped like a four leafed clover. His body and appearance is fairly similar to a typical Gloucestershire Old Spots Pig.